Often installations for the production of energy from renewable sources (FER) are based in remote locations, which do not offer traditional internet access. Nevertheless remote access to these plants is fundamental not only to check production data but also to monitor the security situation there. The 4Power service from Broadsat uses satellite technology to achieve this and to offer telemetry and video surveillance. Internet via satellite is accessible wherever is your business. No limits in coverage, bandwidth and stability as imposed by GSM. 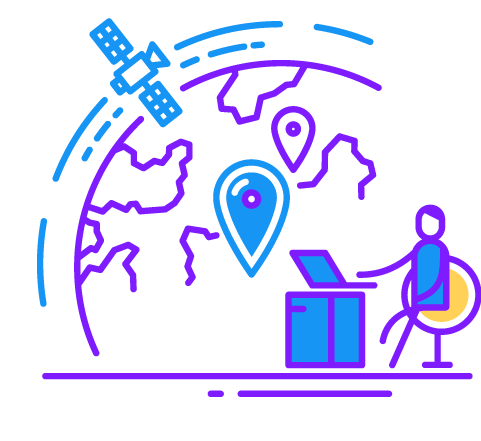 With satellite, we can offer direct data links, which are stable and active 24/7 to ensure you have uninterrupted connectivity. We offer a free public IP address that allows you to connect and remotely monitor your devices located in different places. Get access quickly. Shipment of kits within 2 working days. After the kit is installed, the service is’ immediately available. Telemetry: remote measuring of system variables and parameters. Remote control: make changes to plant status from wherever you are. simulataneous signaling of events, alarms or critical situations. parameters from onsite or elsewhere. Video surveillance: distance monitoring of plants covering a wide area or in remote locations. The Broadsat team worked with enthusiasm and professionalism. They demonstrated particular skills in solving the problems related to the lack of wired and radio connectivity typical in most of our plants. We were able to integrate our know-how beautifully with their experience in networking and security. Thanks to satellite connectivity, our plants are now constantly monitored and guarded. Automation Systems Division Manager, MARCOPOLO ENGINEERING S.P.A.